They call themselves "water protectors" and describe the Dakota Access pipeline ferrying crude oil across America as "the black snake." In "Awake: A Dream From Standing Rock," the Standing Rock Sioux tribe and those who flocked to windswept tribal lands in North Dakota last year to protest the pipeline, get to tell their story on their own terms. "The ambition of the film is really to get people to understand the issue and feel it in a way that's emotional," said director Josh Fox, an environmental activist and filmmaker. "It's really about pushing the movement forward. We also want to say, you guys did something unbelievable, and this is one way of giving a debt of gratitude," Fox said. 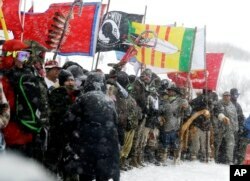 FILE - Military veterans and Native American tribal elders come to a stop for a ceremonial prayer during a march to a closed bridge across from the Dakota Access oil pipeline site in Cannon Ball, North Dakota, Dec. 5, 2016. "The film initiates as a dream, as if the last 500 years of civilization didn't happen," said Fox. "It was an amazing place, and it ran on very different principles than our society - those of sharing mutual respect and non violence," said Fox, who spent several weeks there at the suggestion of "Divergent" actress Shailene Woodley. "Our camp is gone, but our spirit is not broken," says Sioux member Floris Bull White. "Will you wake up and join us?"